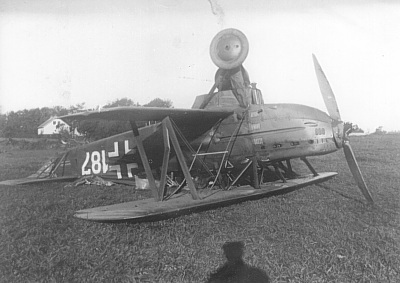 Avia 534 serial number 569 emergency landed at Kragelund 13/10 1941. The aircraft belonged to Jagdgruppe Drontheim (Jagdfl. Schule 3) and was coded 187. Student Pilot Unteroffizier Rudolf Kindlein emergency landed in a field belonging to Farmer Jens Jensen, Charluttenlund near Kragelund at 09:05 hours due to engine failure. The landing went well until the aircraft was half way up the field. A track crossed the field and when the landing gear caught the low banks of the track the Avia overturned and ended up lying on the back. Kindlein was unharmed but was slightly injured when he released his seatbelt and dropped to the ground. The aircraft was 60% damaged. A Danish ambulance was called and took Kindlein to the hospital in Silkeborg for treatment. A farmer living nearby came to help, but when he saw petrol leaking from the aircraft he hurried back home for cans to save the petrol for his tractor. The aircraft was taken back to Grove on the next day. Sources: RL 2 III/771, LBUK.